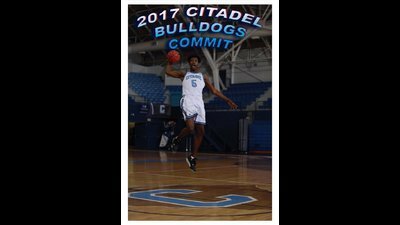 Robert Johnson of Dillard HS in Florida has decided to end his recruitment and commit to The Citadel Bulldogs. The 6'8" big man cited a few factors in his decision to commit to the SoCon military college. "The environment, education/job opportunities after college, and the chance to play big minutes [factored into in my decision]." Johnson held an offer from Lees-McRae and had interest from a number of D1 and D2 schools, including VMI, Kennesaw State, Quinnipiac, and Rider among others. After attending Santaluces HS in Lantana his freshman and sophomore years, he transferred to Dillard in Fort Lauderdale for his junior season. Johnson helped lead the Panthers to a 28-5 overall record and the school's first 6A title since 2008, with a 66-55 win over Largo. Four of Johnson's teammates at Dillard, Jordan Wright (uncommitted), Joniya Gadson (Bowling Green), RaiQuan Gray (Florida State), and Bryce Oliver (uncommitted) have either committed or are being recruited by D1 schools. In his senior season, Johnson hopes to lead Dillard to a second straight title and improve his game. "My strengths are running the lane and scoring easy buckets, blocking shots, and getting rebounds. I look to improve on my shot and handles." The Citadel went 10-22 last season, going 3-15 in conference. Led by second year head coach Duggar Baucom, they currently hold commitments from forwards Hayden Brown of South Carolina and Derek Webster of Florida. Johnson looks forward to wearing Citadel blue and white. "[Citadel fans] can expect a good dominate big that can help and play different positions."